Sweet peas Lathyrus odoratus are an old favourite annual flower. Their long stems and wonderful fragrance make them wonderful cut flowers. Most of the best cut flower varieties grow on long trailing vines that can reach up to 2m in height and that feature keeps them confined to being a bit of a specialty plant. Most casual gardeners want to plant a flat of instant colour and then let it fill their beds all summer with minimal input from that gardener. Despite the hours that I spend in my garden, I have rarely tried to grow the big vining types. This year, 2009, that is going to change. I did try to grow some dwarf varieties in containers last year. I have already planted some seeds indoors. What is Involved? Apparently you can have some success if you just plant them outdoors as soon as the soil is workable. I have saved some of my seeds to test that theory. The rest I have started indoors about four weeks before I expect to be able to plant them out. I should have started a couple of weeks sooner but we gardeners are always pushing the limits. They Look Hard? To enhance the germination it is often recommended that you nick the very hard seed coats. 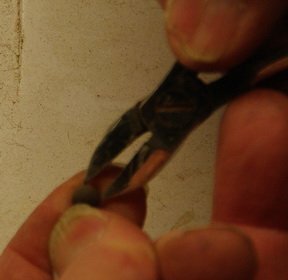 I use a nail clipper and don’t worry to much about how small a nick I make. Smaller is better as you don’t want to damage the actual seed. In some varieties a small nick will actually result in most of the seed coat falling off. Doesn’t seem to be a problem. What Containers? 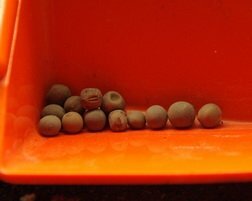 As the seeds are relatively large, (they look like peas surprisingly enough,) I plant them into a container that they can remain in until they are moved outside. 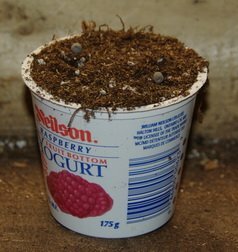 Being frugal by nature, I find old yogurt containers, (with drainage holes added,) work quite nicely. As they are relatively inexpensive I put two seeds in each container and then pinch out the smaller of the two. They seem to germinate a bit more evenly when given some bottom heat but it’s not a necessity. They Germinated - Now What? If they both come up I will remove the smaller one. When the other one gets 3 - 4 pairs of leaves I will pinch out the growing point to make the plant branch out and become sturdier. I will move them out to my cold frame as soon as I can, as Sweet Peas are quite happy growing in a cooler place and my Peppers would rather have the slightly warmer space in the basement. 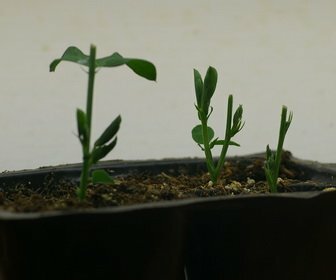 As all peas can get their own nitrogen, I will not be fertilizing these little seedlings until they make it to the garden. Garden Soil? Sweet Peas do like to feed heavily when they are growing so I will be preparing the soil where I plan to plant them with lots of compost. I also need to create some sort of support structure for the vines to grow up. I plan to grow them along a fence line and I will hang some plastic netting from a wire attached to the top of those fence posts. They can get quite heavy as they grow so we must make sure our structure is sturdy enough. The location needs to be in full sun although a tiny bit of shade on hot summer afternoons would probably be helpful to keep them blooming. Keep Coming Back Here! I will continue to update this page as I continue my experiences with these Sweet Peas. Hopefully I will do it early enough that you can all follow me.